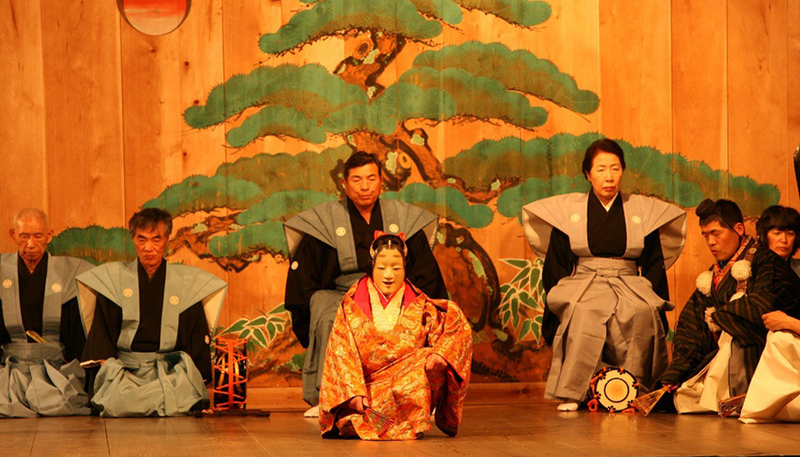 Visit this beautiful island’s Noh theatre! There is this saying in Sado, “maitaosu” (literally: to dance to the fullest). This expression describes a wealthy head of the household who gets so devoted to Noh that he spends all of his fortune on it, for instance, by inviting top-level performers from the mainstream schools of Noh. This signifies how widely spread Noh theatre was in Sado. Sado, where Zeami (who brought Noh performance to perfection) was exiled, is an island of Noh theatre, which developed greatly in the Edo Period (1603-1867). Taking deep root in local communities, Noh culture has been cherished over generations. 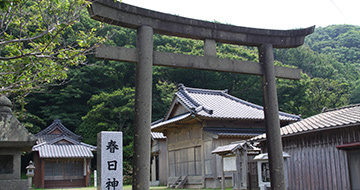 Sado is known as the place where Zeami was forced into exile, but Noh actually spread across the island in the Edo Period, when Nagayasu Okubo, the first Commissioner of Sado, brought it with him to Sado. Because Sado produced gold, it was placed under direct control of the Tokugawa Shogunate. 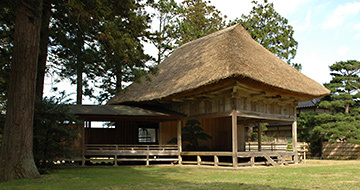 The island’s Noh uniquely evolved to one that was dedicated at shrine festivals, and became widespread as “the people’s Noh.” Mr Toshihiro Kondo recalls with nostalgia, “It seems to me it was a norm among influential people, such as community leaders, to have knowledge of and the ability to perform one Noh chant or two. I remember seeing and hearing them chanting in festive occasions, such as wedding receptions, seasonal observances, festivals, and parties where people gather, when I was a child.” Mr Kondo is a representative of Sado no Noh wo Shiru Kai, a grass-roots group with the aim of raising cultural awareness for Noh and local traditions in Sado. 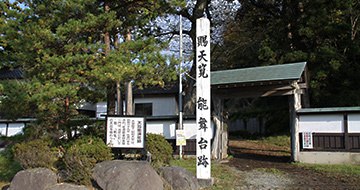 Based in the Kanai area, Sado no Noh wo Shiru Kai actively organises various events, which include: Candlelight Noh, held in honour and memory of Zeami, who is closely associated with the area; a traditional performing arts show demonstrated mainly by women; and workshops to learn about Noh through essential stage items, including costumes and musical instruments. Other groups are also working diligently to expose more people to the art of Noh. It is also included in the local schools’ curriculum. 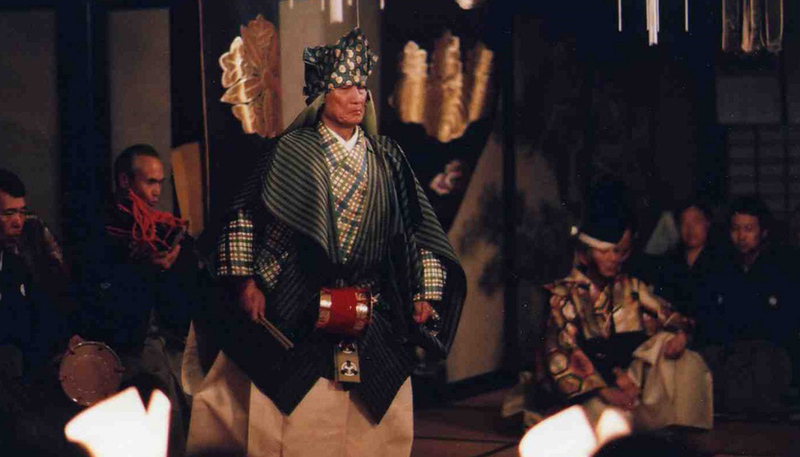 Thus, Sado’s Noh culture is being passed down in a variety of forms, and the range of Noh-related activities is expanding. 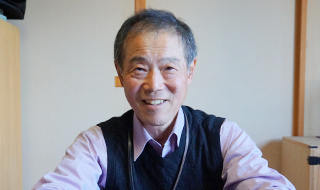 Toshihiro Kondo is a representative of the Sado no Noh wo Shiru Kai, which was derived from "Kanai Iki-Iki Juku," a regional revitalisation group based in the Kanai area. The group is actively invloved in local revitalisation projects through Noh. Although you are interested in Noh, it might seem exclusive and hard to watch. Even if you attended a Noh performance, you might have hardly understood what was happening on the stage, and just sat there, drowsing. If that is the case, give Sado’s Noh a try, and discover the elegance that it has to offer! 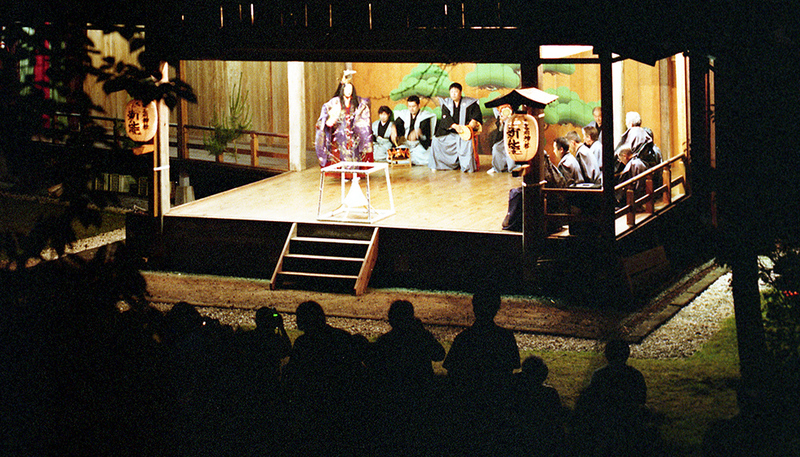 Most of the Noh stages in Sado are located within shrines and the audience sits outdoors. Therefore, Noh in the evening is always performed in the romantic glow of bonfires. These fires crackle in silence surrounded by darkness, as the performance solemnly begins on a stage with minimalised settings and properties. The surrounding nature, such as the chirps of insects, breezes rustling the leaves and branches, and glimpses of the moon, accidentally give added impact, making the show even more dramatic and complementing the world of subtle beauty. The magical atmosphere of bonfire Noh will entrance you, even if you don’t do your homework before the performance. Sado’s Noh-watching style is more laid-back than in other parts of Japan. Since Noh developed as a performance dedicated to shrines, audience members used to bring boxed meals to the venue, and enjoy the festivities while watching Noh. As a reflection of this tradition, eating and drinking are allowed during many performances today. Spontaneous applause may arise from the audience during performances, too, something that does not happen in other parts of Japan. 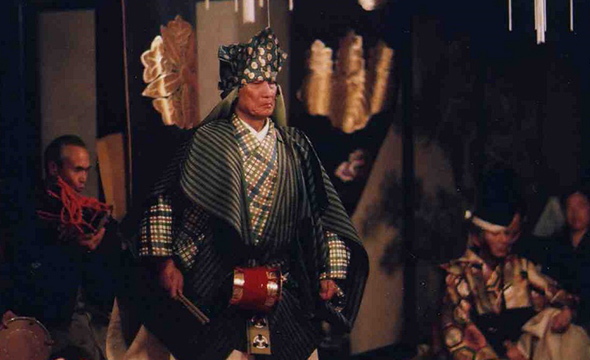 As Zeami pointed out in his work, “Fushi Kaden,” Noh theatre companies will not succeed if they are not loved by common folks, and Sado’s Noh is surely loved by ordinary people. Taking photos during some performances is allowed. “At Noh performances dedicated to shrines, you are allowed to take photos so that you can share in the celebration together. But please be mindful of other audience members and the performers, and turn off the distracting camera shutter sound. Refrain from moving around and blocking the sight of others, and turn off the flash when photographing performers, as they are wholeheartedly performing in up to 20kg costumes. 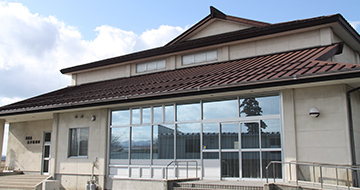 Please keep in mind the efforts made by shrine parishioners to make these performances possible,” says Mr Kondo. Check with shrines or organisers in advance to see if photography is allowed, and if it is, please behave appropriately. Sado natives’ enthusiasm and love for Noh seem to inspire performers. 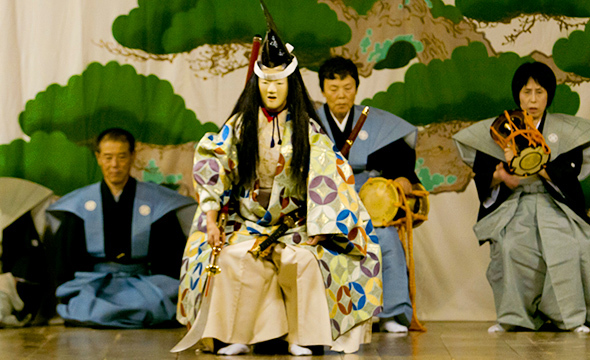 Numerous innovative Noh programs have been created, as well as experimental programs in collaboration with other genres, making Sado a stage for new cultural creations. 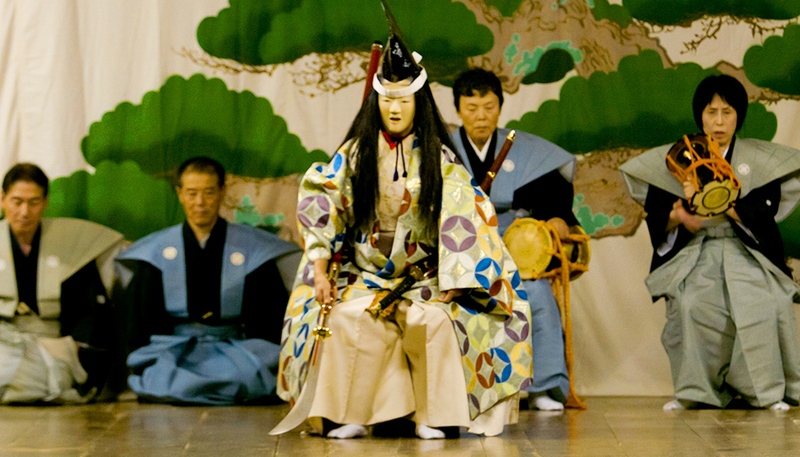 Sado makes these new challenges possible, as Noh is, literally, a living tradition here. You will get hooked on the wholehearted performances. Please behave appropriately when taking photographs is allowed. Watch, touch and walk to enjoy Noh in Sado! 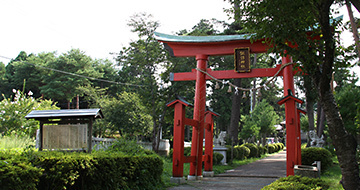 At Shiizaki Suwa Shrine, Tenryo Sado Ryotsu Takigi Noh Performances begin in May and a total of five Noh showings take place through October, except for the month of August. Mr Kondo explains why, “When farmers finish planting rice seedlings and most of the spring farmwork is done, many villages dedicate Noh performances to the tutelary deities, praying for bumper harvests. Sado no Noh wo Shiru Kai hosts the “Shoboji Temple Candelight Noh Performance” every June. 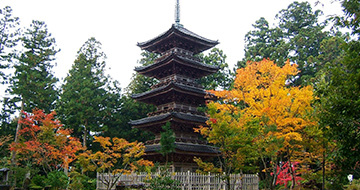 Shoboji Temple is closely associated with Zeami, who stayed there after he was exiled. On top of the Noh performance, the temple’s treasured ritual mask, “Beshimi,” a mask with its mouth clamped firmly shut, is on display for the public. It is said that Zeami brought this mask, which is also called a mask for rainmaking, with him to Sado. Visitors can spend an elegant evening, fully immersed in the world of Zeami. Moreover, the temple’s treasured ritual mask, “Beshimi,” which is a mask with its mouth clamped firmly shut, also called a mask for rainmaking, is on display for the public. It is said that Zeami brought this mask with him to Sado. Shuttle bus services (advanced booking required) operate between hotels and venues for some Noh performances in June. In addition to seeing an actual Noh performance, it is highly recommended that you follow in the footsteps of Zeami and visit as many Noh stages around Sado as possible. At its pinnacle, there were up to 200 Noh stages in Sado. 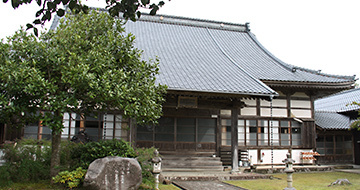 Considering that over thirty Noh stages remain in existence, there is an unparalleled density of Noh stages in Sado. Among others, the Noh stages at Nyakuichioji Shrine (Sawata Nakahara), Ushio Shrine (Niibo Katagami), Kamo Shrine (Hatano Awanoe), and Daizen Shrine (Mano Takeda) are called the four Noh stages in the Kuninaka area, where large-scale Noh performances have been regularly held. 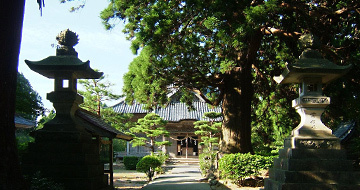 Noh stages in three of the four shrines, excluding Nyakuichioji Shrine, remain to this day, and each has a sense of a dignity and a distictive atmosphere, representative of Sado. 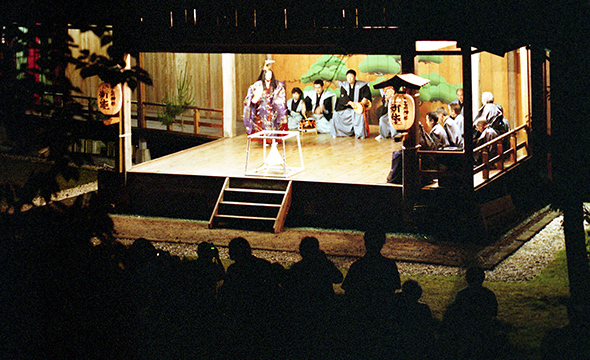 The Noh stage in Daizen Shrine, especially, is known as the one related to the play “Danpu,” and considered the oldest among all the others still in existence. 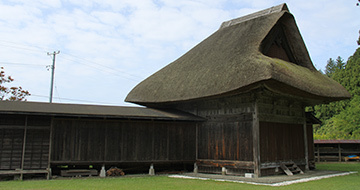 Reconstructed in 1846, the Daizen Shrine’s Noh stage has a hipped, tiled roof. This elegance, complemented by the surrounding landscape, attracts many visitors. 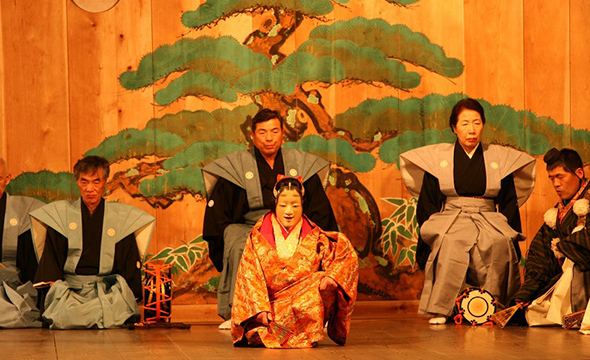 How about a trip to get to know the history and cultural climate of Sado through Noh? Click here to see the 2017 Noh performance schedule.